Michael Limburg of the European Institute for Climate and Energy here reports that Germany will miss its 2020 Greenhouse Gas (GHG) emissions reduction targets by a long shot ,despite the “huge costs” in the form of mandatory feed-in tariffs paid by consumers. The country’s 2050 target of an 80% reduction is looking more like pie in the sky. 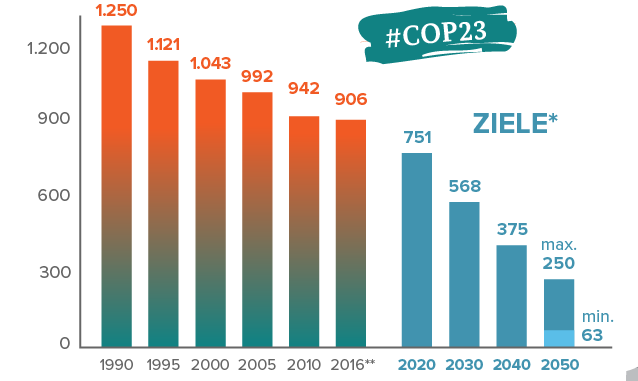 Originally Germany pledged on its own to reduce its greenhouse gas emissions by 40% compared to 1990 levels by 2020. Instead it appears the country will achieve only a 30% reduction. Much of these reductions occurred after the fall of Communist East Germany after the shut down of its horribly inefficient industry. Over the past 10 years Germany has been struggling to reduce greenhouse gas emissions at all. The harsh reality is that Germany has not reduced GHG emissions in 7 years. GHG emissions in CO2 equivalent in Germany and targets until 2050. Source BMUB German Ministry of Environment. Limburg writes that German Environment Minister Barbara Hendricks blamed others for the lack of progress, particularly German industry. Though German environmentalists like putting climate change at the top of their list of major problems to tackle, Germany has done very little about it. Limburg notes that Germany’s share of global GHG emissions is too small to make any real difference at all. The country emits only 2.2% of the globe’s man-made CO2. In this case, there is a broader gap between 2016 and 2020 than between any of the other bars. That wider gap represents 4 years. Gaps on the left side represent 5 years. Gaps on the right side represent 10 years. That extra-wide gap is where I see the note: Then a miracle happens. Don’t knock it, John. Massive CO2 reductions will position Germany to retake the lead in the transportation industry. Sure, with only 1 headlight the emissions will be cut in half. Oh, yes, and don’t even get me started on photon emissions. 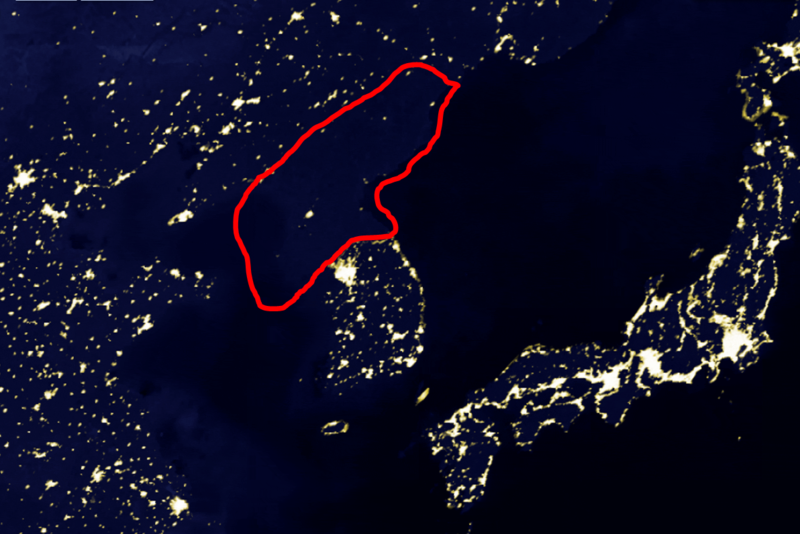 Light pollution is a problem everywhere but in places like North Korea. Just look at Japan, there. How do the Japanese even sleep at night? Huh. Link didn’t work. Here it is. Does the graph look unrealistic to you now? Appart from 2016 being a little bit high, it is more or less a linear trend beginning from 1990. As for the colors: it should be quite clear that those blue bars are the goals and the other ones are the actual emissions. Here of course you are hiding the fact that there has been no emissions reductions in over 7 years. You presented a chart that only represents wishful thinking. The current political constellation bodes very ill for the next 4 years. Germany likely will have a very hard time getting below 890 million by 2020, and probably won’t get much below 900 million. AGAIN, for those stuck in Fantasyland, the 750 million tonne target by 2020 is pie-in-the-sky. Of course, Sebastian, if you are so sure of Germany’s progress, then you would have no trouble making a substantial bet on the 750 million figure. The chart is the same chart you presented but stretched to have a linear x-axis. Why is that wishful thinking? Is setting goals that can be reached without changing something a good thing? Nope … you set goals because they are hard to achieve. Same as you “it’s going to be -2.x degrees below average by 2020” bet? As human are not the main CO2 generators on this planet, then whatever Germany does will be ineffectual. Wind and solar generation to the grid do eventually reduce CO2 emissions by crippling the economy. South Australia is a good example. The State network managed 39% of wind and solar share in 2016; more if the behind the meter generation is taken into account. The State no longer has base load because all the medium and heavy manufacturing has shut for good. On a mild, sunny day when the air-conditioning demand is low and the rooftop solar going strong, the demand drops to its minimum through the middle of the day and that minimum is only 1/6th of the maximum demand during the evening peak on a hot day. The State continues to add more hardware such as fast response gas turbines, diesel generators, a big battery and a concentrated solar plant but funding now from general revenue; essentially support from other states and the federal government. The low intensity electricity users are installing their own solar and batteries so are consuming less from the grid most of the time. The cost of the grid can no longer be recouped from the diminishing consumer base. Some households are already self-sufficient with electric power using rooftop collection. What grid operators and network owners have failed to realise is that there is no economy of scale with solar, albeit some minor sighting advantage, and little economy of scale with wind. The cost of transmitting the power from dispersed decentralised generators into a network makes grid power more expensive than any individual household can do with their own rooftop solar by avoiding the cost of transmission. Ultimately those who want the lowest cost power will have their own solar collection and battery storage. In Australia, most households can achieve independence from the grid for the cost equivalent to a medium sized car. Depending on the financing, this is already lower than the cost of grid power in South Australia. So the charge toward 100% renewable means the demise of the grid and households/businesses buying components supplied from countries that still have reliable, low cost electricity and retain their manufacturing industry (China for example). The present path is unrenewable because wind and solar do not produce enough reliable energy over their life to maintain the system. That’s the major problem with renewables, them eventually becoming cheaper than grid power and thus making a grid connection even more expensive because it can’t be recouped with a small fee on the electricity prices anymore. At least for household electricity. But cheaper batteries will not only help households become more energy independent. They should also be able to eventually replace those power plants that keep the frequency stable and thus make providing electricity cheaper again. We’ll see … the current pricing trends of all renewables and batteries should make big 50+% renewable grids cost-effective, especially compared to the huge external costs of conventional power generation that aren’t priced into the kWh-price. The present path is unrenewable because wind and solar do not produce enough reliable energy over their life to maintain the system. According to a source that I can’t seem to find anymore, wind+solar have surpassed the point where the new installations of new panels/turbines per year cost more energy than all active panels/turbines generated in that year long ago. Your unreliables ensure that the grid system becomes over-complex and expensive. Abandon the unreliables and get back to a simpler more cost effective grid system. The MAJOR problem with wind and solar power (aka ruinables or unreliables) is that they are, as a practical means of making dispatchable power, a huge waste of money. They blight the landscape, and their only worth is providing some rich people to gain more wealth from the public by the vast amount of subsidy they attract. Take away the subsidy and they die, and quickly, however no government has the Cahonies to stop funding them. The Western government’s are full to bursting with idiot pushing this regress technology on the public much to the enjoyment of the wealthy few. the issue with all home solar/wind power is that at some point the sun doesn’t shine and the wind does not blow and the battery runs down, at that point you have to be hooked up to the grid (as south Australia recently found out) to supply that temporary power, which by necessity will have to be very expensive to produce and deliver.